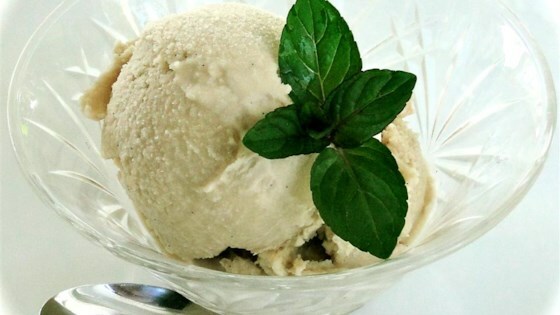 "I LOVE Irish cream ice cream, so when I got my own ice cream maker I went looking for a recipe to duplicate it. To my horror after an extensive search of the internet I could only fine one, and it was WAY to large for my 2-quart maker. So I came up with one of my own. The result was a surprisingly good substitute for the expensive brand! Because of the liqueur it takes a bit longer to harden than the recipes without liqueur, but the wait is worth it!" Beat together half-and-half, white sugar, and brown sugar in a large bowl with an electric mixer on medium speed until the sugars have dissolved. Stir heavy cream and vanilla extract into the mixture until smooth. Pour the mixture into an ice cream maker and freeze according to manufacturer's instructions. About 2 minutes before the end of freezing time, pour Irish cream liqueur into the ice cream maker; allow the machine to finish freezing the ice cream. Transfer ice cream into a freezer-proof container with a tight lid and place in freezer until ice cream is hardened, at least 4 hours. This was great! To cut down the fat a little, I used 4 cups of half & half instead of 2 cups half & half, 2 cups heavy whipping cream. Thanks for the recipe. This is hands down my new favorite ice cream! I used 3 cups of whipping cream and 1 cup of 2% milk and it turned out really well. Will definitely make this over and over in the future. Make this a day ahead. It takes a while to set up with the alcohol in it. Huge hit as our (adult) dessert for st. patty's day! Amazing. A wonderful companion to a "girls night out".